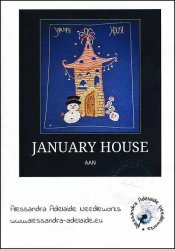 January House [W1007] - $15.28 : Yarn Tree, Your wholesale source for cross stitch supplies. Cross stitch pattern by Alessandra Adelaide Needleworks. Look who is greeting you to the entrance of "January House." It's Mr. Snowman! Peaking through the windows of the house are snowman, looking about to see who might be entering. A strand of star lights have been hung by the roof. Stitch count is 150 x 201.